Antiphospholipid antibodies (APL) in patients with Systemic Lupus Erythematosus (SLE) are common. Persistent positivity is known to increase the risk of thrombosis and pregnancy morbidity and predicts early damage in patients with SLE. Testing for APL is part of the American College of Rheumatology (ACR) and the Systemic Lupus International Collaborating Clinics (SLICC) immunologic criteria for SLE. The purpose of the Quality Improvement (QI) project was to determine the percentage of SLE patients in whom APL were checked before and after intervention at the Parkland Rheumatology Clinic—the largest urban safety net hospital in Dallas, Texas. Initially, 150 Parkland Rheumatology charts with an International Classification of Disease (ICD)-9 code of 710.0 were selected at random and reviewed for the presence of APL (lupus anticoagulant, anticardiolipin, and beta 2 glycoprotein I). Patients who met the ACR or SLICC classification criteria were included. APL testing done before July 2012 was recorded. Charts with ≥ 2 APL were counted as “Yes” and < 2 APL were counted as “No”. The intervention consisted of a 6 month education period focusing on the impact of APL in SLE. This consisted of a series of case presentations and journal club by the fellows, guest speakers with expertise on Antiphospholipid Syndrome, and a QI related SLE-APL literature review. Verbal reminders were made to the providers on their clinic days. Subsequently, another 150 Parkland charts with an ICD-9 code of 710.0 were selected at random and reviewed for the presence of APL. Patients not seen in the clinic after July 2012 were excluded, as changes after intervention could not be applied to these patient’s charts. Fisher’s exact test was used to investigate the change in APL testing in SLE patients before and after the intervention. 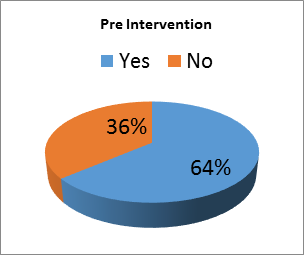 Pre-intervention data showed that in 95 (64%) charts APL were checked, and in 54 (36%) charts APL were not measured. 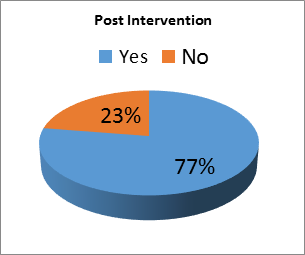 Post-intervention, in 93 (77%) charts, APL were checked and in 27 (23%) charts APL were not measured, see Figure. The intervention was significant for a change in APL testing in SLE patients by the providers (p= 0.02). Routine APL testing in patients with SLE is often overlooked. It is important to identify APL in SLE patients for diagnostic, therapeutic and prognostic purposes. In this QI project provider education significantly improved the testing for APL in patients with SLE. 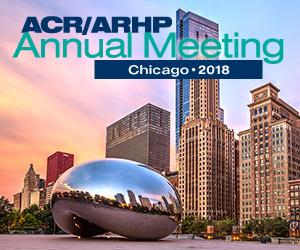 Future interventions include ongoing education strategies and creating rheumatology template notes with smartphrases in the electronic medical record.